Did you miss any of the events? The presentations slides are still available! Please contact sales@sharingminds.com.au and one of our friendly team would be more than happy to send you through a copy. Sharing Minds recently concluded the final event of our 2018 Breakfast Series – a collection of events designed to empower you with the knowledge to create an intelligent digital workplace which fosters collaboration and productivity. The first event, held on Wednesday 19 September, focused on managing governance and increasing user adoption in Microsoft Teams. The first session of the event was a tour through Teams, where the audience was provided tips to best engage with the tool to encourage user adoption. Paul Olenick, AvePoint’s Product Strategy Director, led the second session with a presentation centered around the importance of maintaining governance of your organisation’s Teams environment. Paul emphasised the importance of “right-sizing” governance mechanisms and the key areas to balance when managing the usage of Teams. 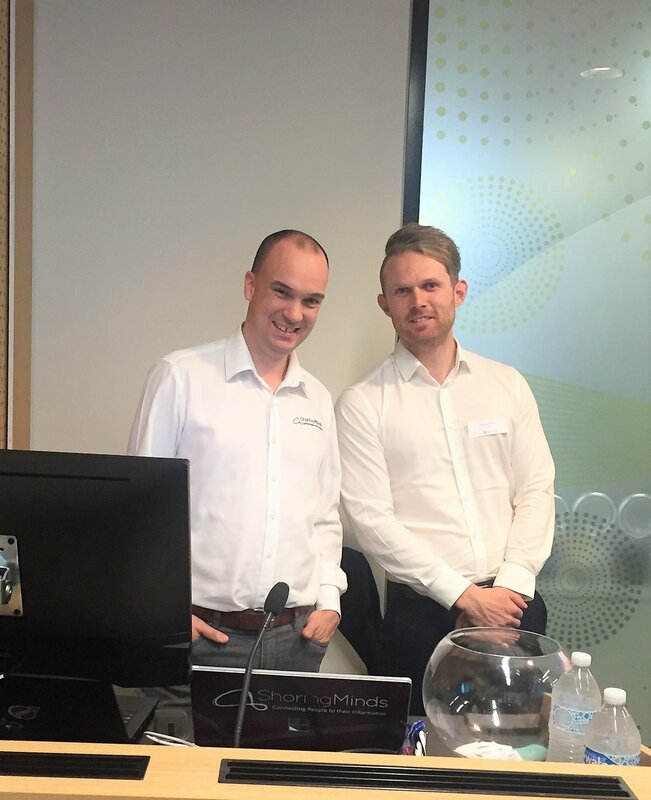 Workflows was the topic of the second event on Tuesday 9 October, with our partner Nintex at the Microsoft Brisbane office. Sharing Minds’ CTO Adam Clark explained the criteria upon which each workflow technology was judged and the overall process which led to Nintex being chosen during a recent customer engagement. Adam then gifted the audience with his Top 10 Workflow Selection Tips. Request the slides to find out what Adam’s top tips are. Nintex Sales Engineer Mathew Johnson demonstrated the ability of the Nintex platform to connect with Microsoft systems including Azure Cognitive Services, Dynamics and Office 365. The demonstration showcased the capabilities of Nintex, including Advanced Workflow, Connectors, Modern Forms, Mobile App, DocGen and Process Intelligence. The final event of the series took place on Tuesday 23 October with our friend and partner LiveTiles at the Brisbane Microsoft office. Toowoomba Catholic Schools’ Kevin Berry and Bill Medill walked the audience through their recent project with Sharing Minds to overhaul their corporate intranet site and encourage each of their schools to design their own intranet sites by embracing the capabilities of LiveTiles. LiveTiles’ Director of the APAC region, Damien Neale, announced their Roadmap for 2019 and Dennis Drover, LiveTiles’ Innovation and Experience Specialist, rounded out the event by demonstrating LiveTiles’ functionality, showcasing the drag and drop design and search bar features.